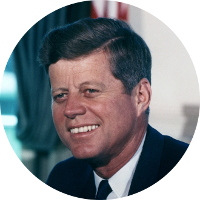 John F. Kennedy was the 35th U.S. President. He served in the U.S. Navy during World War II where he became a war hero for actions he took after the sinking of his boat PT-109. During his presidency, her presided over major world events that included the Bay of Pigs invasion of Cuba and the Cuban Missile Crisis. One of his first presidential acts was the creation of the Peace Corps and he was the first to announce to the nation the goal of landing a man on the moon. President Kennedy was assassinated by Lee Harvey Oswald on November 22, 1963. All eight of JFK's great-grandparents immigrated to Boston from Ireland during the middle of the 19th century. They were a part of a wave of Irish immigrants that had fled the Great Potato Famine when a fungus spread across Ireland destroying successive crops. The ancestors of John F. Kennedy were among the Irish Catholic immigrants who struggled for their part of the American dream. They lived in slums and were treated as second class citizens. It was from these slums that the family of John F. Kennedy rose to become one of America's most famous and powerful political families. For John F. Kennedy, his famous kin were the immediate family around him. These included his father Joe Kennedy who was a U.S. Ambassador and the first Chairman of the U.S. Securities and Exchange Commission, and two brothers who were both U.S. Senators. What Kennedy lacks in famous blood relations, he more than makes up for in famous people who've married into his family. There is William Cavendish, Marquess of Hartington, who married JFK's sister Kathleen Kennedy. He was heir to the Dukedom of Devonshire, and a royal descendant whose ancestors included King James II of Scotland, Alfred the Great, and Charlemagne. Also Robert Sargent Shriver Jr. who was the 21st U.S. Ambassador to France, founder and first Director of the Peace Corps, founder of the Jobs Corp, founder of the Head Start Program, and 1972 U.S. Vice-Presidential candidate on the Democratic ticket with George McGovern. Plus there are the celebrities Arnold Schwarzenegger and Peter Lawford. Arnold Schwarzenegger married JFK's niece Maria Shriver. He is a movie actor, 7-time Mr. Olympia, and former California Governor. Peter Lawford married JFK's sister Patricia Kennedy. He also was a movie actor and part of the "Rat Pack" that included Frank Sinatra, Dean Martin, Sammy Davis Jr., and Joey Bishop.